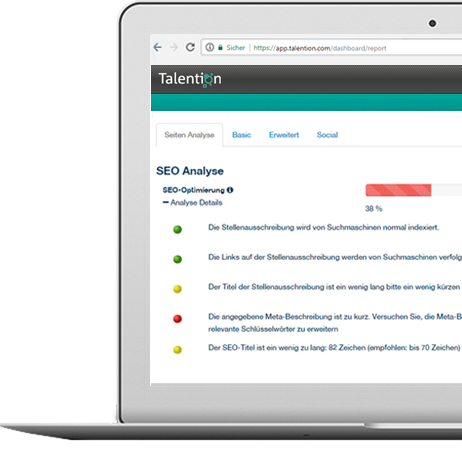 We’re happy to give you tips about how Talention can support you to process your applications faster and easier. Efficient applicant tracking and lean and modern recruiting processes. A job advertisement should look professional and convince the candidate that you’re the right one. By using attractively designed templates, you can create a suitable job advertisement in just a few clicks. The management of applications and correspondence often takes a lot of time. Thanks to transparent and automated processes, you can reduce your administrative costs and efforts to a minimum. 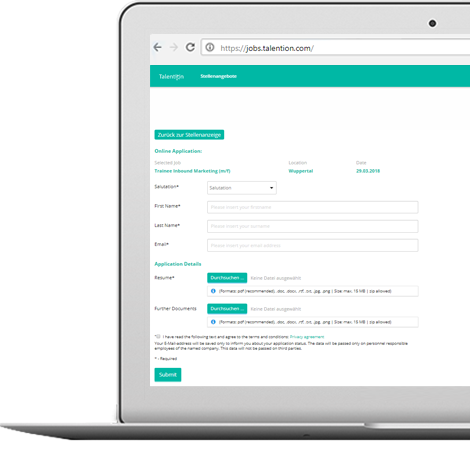 Get found on job boards, in job search engines and in general search engines in an optimal way, and in doing so, continuously expand your reach. The Talention reports in the form of graphics and diagrams give you important insights which help you to continually improve your recruiting process. "Implementation of Talention was fast and uncomplicated. Our contact person was personally always at our side so that we felt well advised and well prepared. After just a short time, we were already able to get things moving."